As regular readers will know I really like the tools provided by Hashicorp and today I found an excuse to use one. I needed to bring up a Virtual Machine in Microsoft Azure. I hadn’t logged into Azure for quite a while so imagine my shock when I opened the dashboard, it’s not that great and the beta of the new one isn’t that brilliant either. It was so bad I tweeted about it …. 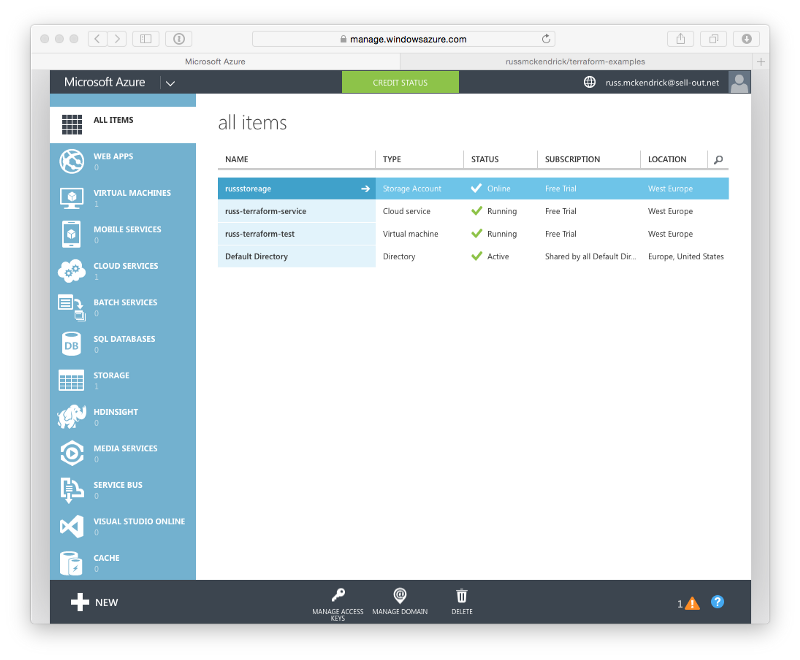 The Azure control panel (both the beta and existing one) is awful. I had recently looked at Terraform for another project and I worked through the excellent getting started guide which covers how to launch AWS Instances. I decided that it maybe more straight forward to launch my test Virtual Machines using Terraform rather than going through the dashboard, apart from the storage container which I created ahead of launching my configuration. Terraform is straight forward to install if you have Homebrew installed, none Mac users can follow the install guide. 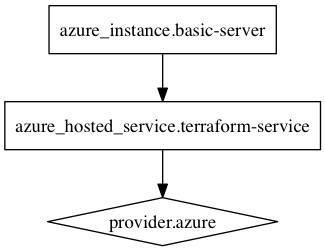 There is a Cask version of terraform, this does not ship with the Azure provider so use the main brew package instead. Graphviz is installed so that the graph functionality can be used. I downloaded a copy of my Publish Settings from https://manage.windowsazure.com/publishsettings and renamed the file to settings.publishsettings. I then created terraform configuration (which can be found in the following repo https://github.com/russmckendrick/terraform-examples/tree/master/azure). “apply” is called, Terraform can’t guarantee this is what will execute. As you can see from the GUI below it launched the Cloud Service and Virtual Machine as defined. description = Hosted service created by Terraform. Apply complete! Resources: 0 added, 0 changed, 2 destroyed. As a Mac / Linux user I found the whole experience to be a lot more what I am used to with other cloud services and a lot less “Microsoft” than I feared.